The cattle started off the month inside, finishing off some hay but when the weather cheered up, they went out for good. Mabon, our only bull calf from last year, had a date with the vet, which he took very well; he is very friendly and easy to handle, even when his reproductive organs are being removed! We have been getting fences and troughs ready for the arrival of our organic grazier’s cattle on 01 May. Our cows and calves went into a large, grassy field, while the rest of the herd went off to our land a mile away to do some important ‘conservation management’, clearing the old grass from our flower-rich hay meadow and grazing a rush ‘rhos pasture’. This part of the farm has been the scene of some spectacular feats in fencing! 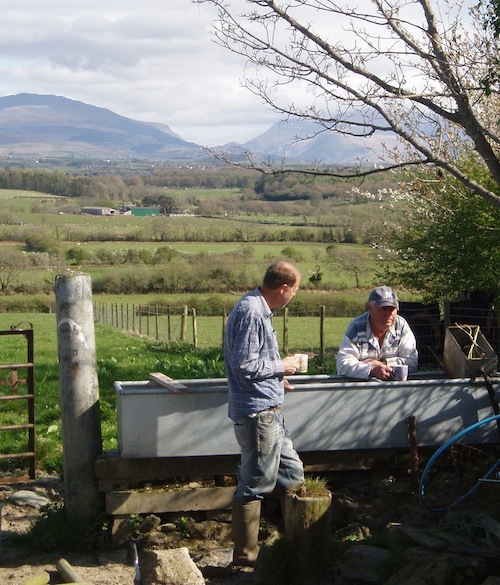 Contractors supported by the Anglesey Grazing Animals Partnership (website) have secured the boundaries of the rough so that the plant communities in need of grazing can be grazed; the idea is that the meat from these animals will be marketed as ‘wildlife friendly’. The asparagus in the poly tunnel is producing about half a kilo of spears a day, and it is stretching our imagination to find new things to do with it! But we haven’t tired of the flavour or the luxury of having our own organic asparagus straight from the ground to the fork via the oven. As we failed to eat all the beetroot last winter, it’s still in the ground. We have discovered that the shooting young leaves are delicious in salads, to go with the abundant rocket and early lettuce. To go with the asparagus and salads, we have had rabbit! They are very pretty scampering around the vegetable garden but very tasty on the plate. Unfortunately none of us likes converting them from the viagra former to the latter but we had them casseroled, barbequed and diced! We have dug out an old length of flexi-netting and fixed it around the vegetable garden. One rabbit ran straight through it, but at least it keeps the chickens out. One solution would be a rabbit-hunting cat, and we have seen a neighbour’s cat stalking rabbits near the house; the count of rabbits in the chicken enclosure each morning is currently four. If it drops to two or less, we can relax, perhaps because the cat’s been at work. 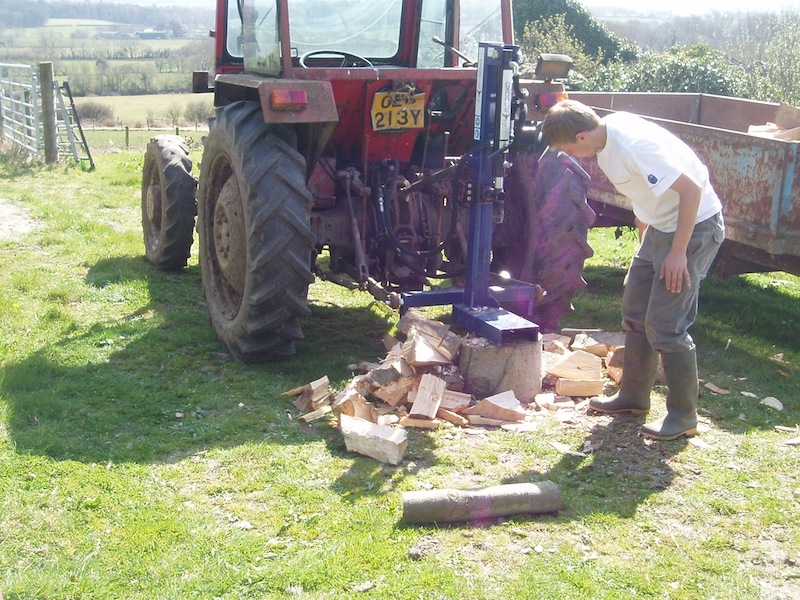 Finally, work on ‘dismantling’ the two fallen beech trees continued after we bought a tractor mounted log splitter. We now have multiple piles of logs ready for next winter. This entry was posted on Friday, April 30th, 2010 at 12:48 pm and is filed under Diary. You can follow any responses to this entry through the RSS 2.0 feed. Both comments and pings are currently closed.